/duːˈʃeɪn/) is a county located in the U.S. state of Utah. As of 2010 the population was 18,607, a 29.5% increase over the 2000 figure of 14,371. Its county seat is Duchesne and the largest city is Roosevelt. According to the U.S. Census Bureau, the county has a total area of 3,256 square miles (8,433.0 km2), of which 3,238 square miles (8,386.4 km2) is land and 18 square miles (46.6 km2) (0.55%) is water. 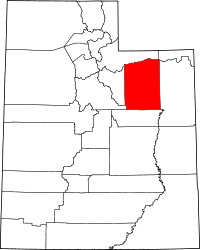 The northern part of the county contains part of the Uinta Mountains. The highest natural point in Utah, Kings Peak at 13,528 feet (4,123 m), is located in Duchesne County. The Ute Indian word doo-shane meaning dark canyon. Fort Duquesne, built by the French in what is now Pittsburgh, Pennsylvania. Rose du Chesne, founder of the Sacred Heart in Utah. An early Indian chief in the region. An 1830s French fur trapper. As of the census of 2010, there were 18,607 people, 6,003 households, and 4,703 families residing in the county. The population density was 5.7 people per square mile (2/km²). There were 6,988 housing units at an average density of 2 per square mile (1/km²). The racial makeup of the county was 89.15% White, 0.24% Black or African American, 4.53% Native American, 0.28% Asian, 0.27% Pacific Islander, 2.64% from other races, and 2.89% from two or more races. 6.00% of the population were Hispanic or Latino of any race. There were 6,003 households out of which 40.23% had children under the age of 18 living with them, 64.72% were married couples living together, 8.65% had a female householder with no husband present, and 21.66% were non-families. 45.0% of all households had individuals under 18 and 22.6% had someone living alone who was 65 years of age or older. The average household size was 3.05 and the average family size was 3.47. In the county, the population was spread out with 33.91% under the age of 18, 6.56% from 20 to 24, 25.38% from 25 to 44, 20.92% from 45 to 64, and 10.66% who were 65 years of age or older. The median age was 29.7 years. For every 100 females there were 102.80 males. For every 100 females age 18 and over, there were 100.00 males. The median income for a household in the county was $31,298, and the median income for a family was $35,350. Males had a median income of $31,988 versus $19,692 for females. The per capita income for the county was $12,326. About 14.20% of families and 16.80% of the population were below the poverty line, including 19.60% of those under age 18 and 12.40% of those age 65 or over. ^ "Duchesne County Quickfacts from the US Census Bureau". http://quickfacts.census.gov/qfd/states/49/49013.html. ^ "2010 Census Interactive Population Search". http://2010.census.gov/2010census/popmap/ipmtext.php?fl=49. This page uses content from the English language Wikipedia. The original content was at Duchesne County, Utah. The list of authors can be seen in the page history. As with this Familypedia wiki, the content of Wikipedia is available under the Creative Commons License.